This week I finished putting the borders on my Double Four Patch quilt. Friday night I loaded this quilt on the long arm and I finished the quilting before supper Saturday night. I was still inspired and my energy levels were high so after supper last night I continued on and finished machine sewing the binding to the front of this quilt. I now only have the hand sewing of the binding to the back of the quilt to do. you can find me in the evenings this week! This is a picture of the progress that I have made so far on my newest quilt. This photo represents the first three rows. 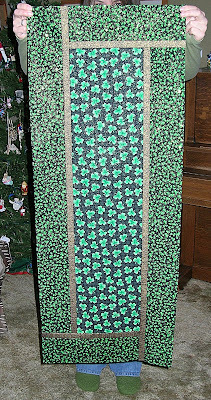 This quilt is a Double Four Patch which I am making following the directions provided by Mary on her blog page. 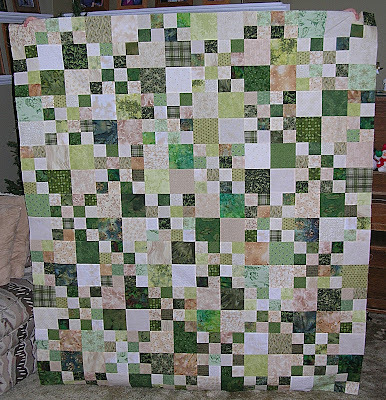 Like Mary, I am making my quilt from a variety of greens and beiges. Since it is Sunday, Judy L has us reporting in on how we are doing on our stash busting. As you already know, I made some substantial fabric purchases in the past week. I am comforted in the fact that I have plenty of company in our guild membership who did exactly the same thing that I did. At our guild meeting this past Wednesday, our President had us put up our hands if any of us had not taken advantage of the fabric sale at Liquidation World. I only saw one person put their hand up! In fact many of us have gone back several times! 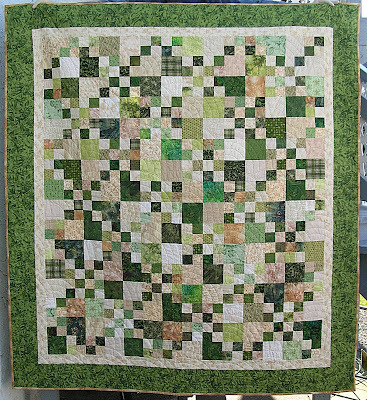 The beiges and many of the greens in the quilt that I am making are purchases from that fabric sale. Does it count towards adding to your stash if you purchase the fabric and within 24 hours have it laundered, ironed, and cut into strips for your quilt? I am very pleased with how this quilt is turning out. 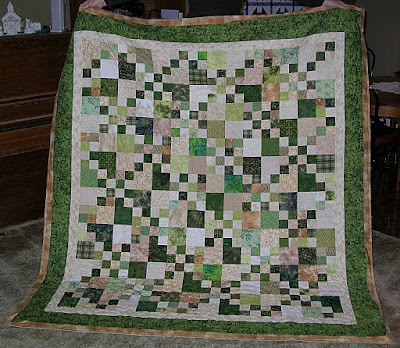 I am sure that the success of this quilt lies in the variety of fabrics that I am using–something that I could not have accomplished with my stash in its condition before the sale purchases. My guilt has been relieved! I am happy to report that I have met my goals for February! My first finish is my February bluework snowman. As you can see, he is currently blind and buttonless. I have discovered the most wonderful beads and so I have given up on the French knots. 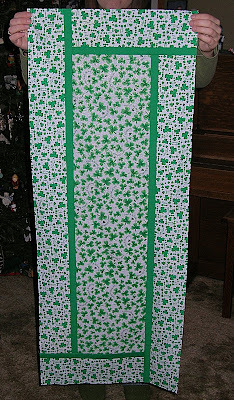 I will add the beads after the blocks are finished, assembled into the finished top and quilted. It is much easier to deal with embellishments after the quilting is finished. I have not yet pressed this block because I am still looking for the perfect stain remover that will remove some stains near the snowman’s head (they don’t seem to show up in the picture, but believe me, they are there). I have been successful in fading the stains, but not in totally removing them. I have tried everything I can think of including rubbing alcohol, lemon juice, the Tide pen, the bleach pen, and some solvent based stain remover. Nothing wants to to totally remove the stains. I must be more careful on my next blocks to make sure I don’t end up with more mystery stains. The second finish for February is my Double Four Patch quilt. The last stitches were taken on the binding tonight. I quilted this one with Circle Lord’s Zig Zag / Wave template. I tried a new batting in this quilt by the Warm Company. The batting is an 80/20 blend and is so light and soft compared to Warm and Natural. It also shows off the quilting nicely. I am going to be using this batting again!